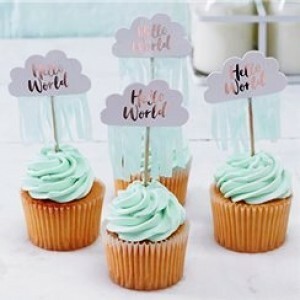 Hello World Cupcake Picks are perfect for popping into the top of cupcakes, sandwiches and other snacks to transform your buffet food for an unforgettable baby shower. The cute gender neutral design features a cloud shaped topper with ‘Hello World’ printed in rose gold foil and strands of mint green tissue paper. Each pick measures 6 x 11cm and they come in a pack of 10.